United States world top food production is vital for world food security and affordable food. ​The most vulnerable poorest regions and the poorest in all regions.are affected the worst by increased food prices. ​Children are affected the most in these populations. ​The IPCC results are very important to understand because it is only the IPCC assessment ​ that is recognized by policy makers and governments. ​​The results are from computer model projections that do not capture many large adverse impacts including prolonged drought, heat waves, floods, and climate variability. ​Also crop diseases, weeds and pests have always been expected to increase under climate change. These model projections then are certainly what will happen at a minimum, but they do not tell us how fast and how bad the real world impacts will be. 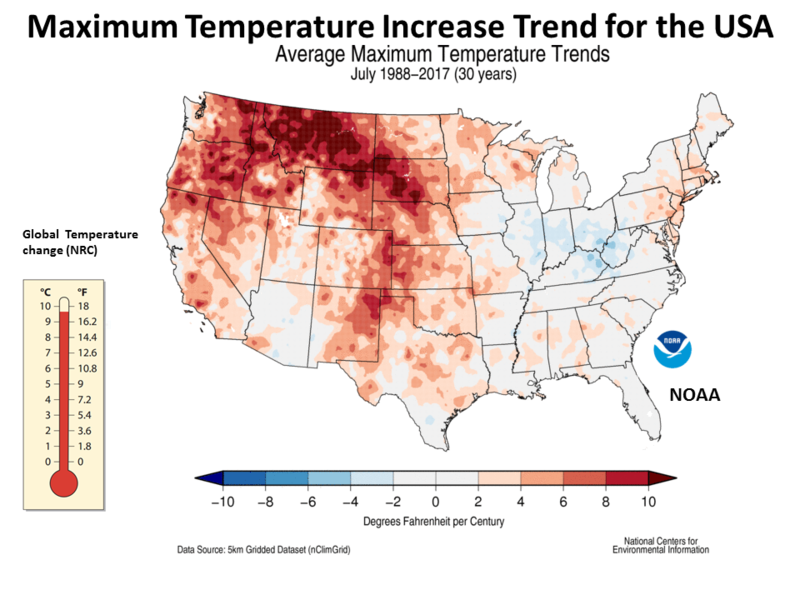 ​'Observed climate trends in North America include an increased occurrence of severe hot weather events over much of the USA, decreases in frost days, and increases in heavy precipitation over much of North America (high confidence).earlier peak flow of snow melt run-off and declines in the amount of water stored in spring snowpack in snow-dominated streams and areas of western USA and Canada (very high confidence). 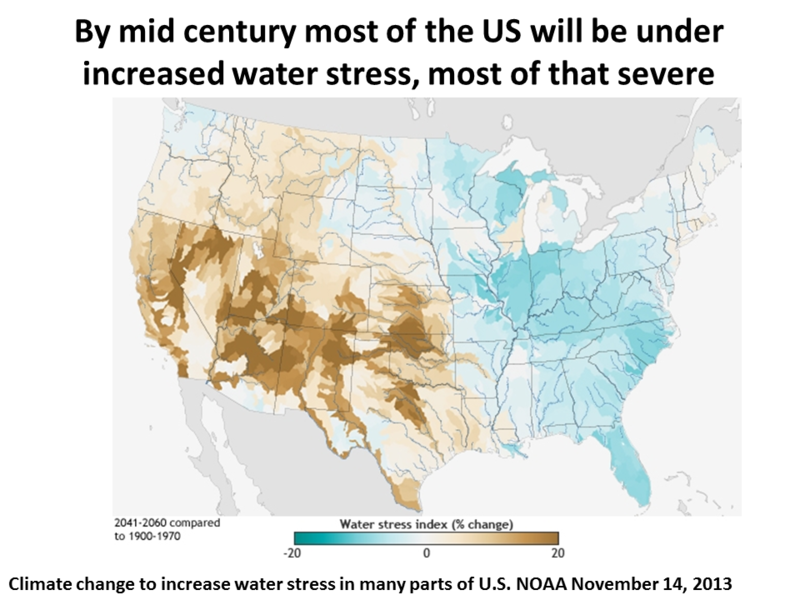 ​​Many climate stresses that carry risk—particularly related to severe heat, heavy precipitation, and declining snow pack—will increase in frequency and/or severity in North America in the next decades (very high confidence). 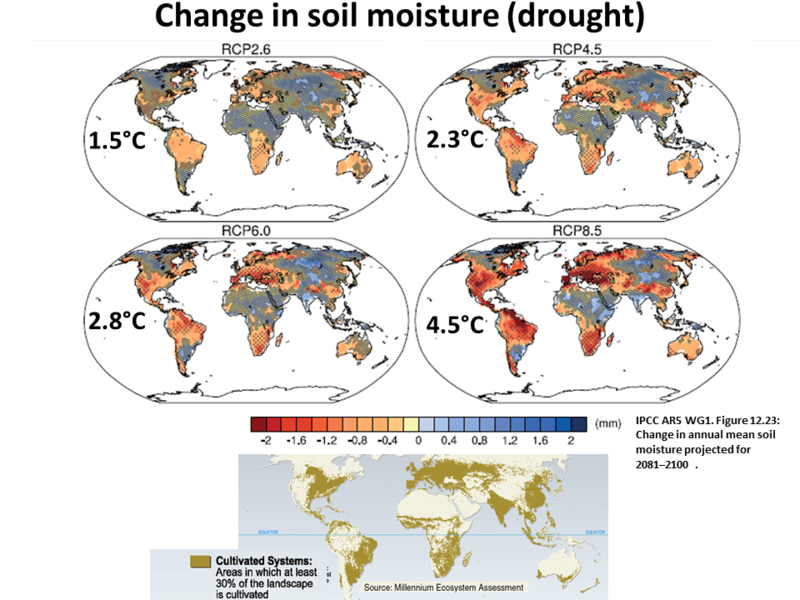 The effects of climate change on crop and food production are evident in several regions of the world. Negative impacts of climate trends have been more common than positive ones. At 1.0C local and global warming are @ the same.- at higher degrees of warming ​​local is higher than global warming. Studies have documented a large negative sensitivity of crop yields to extreme daytime temperatures around 30°C. These sensitivities have been identified for several crops and regions and exist throughout the growing season (high confidence). Several studies report that temperature trends are important for determining both past and future impacts of climate change on crop yields at sub-continental to global scales. 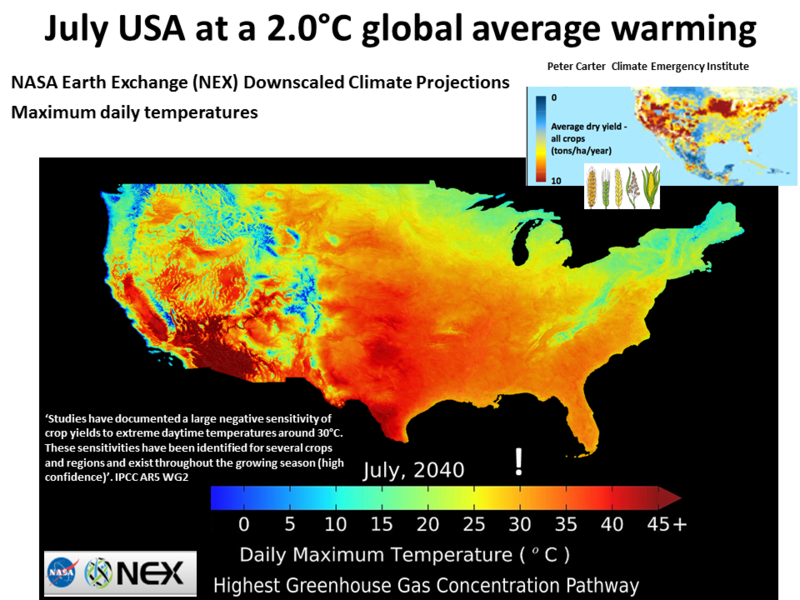 ​​Changes in climate and CO2 concentration will enhance the distribution and increase the competiveness of agronomically important and invasive weeds. ​​Rising CO2 may reduce the effectiveness of some herbicides. 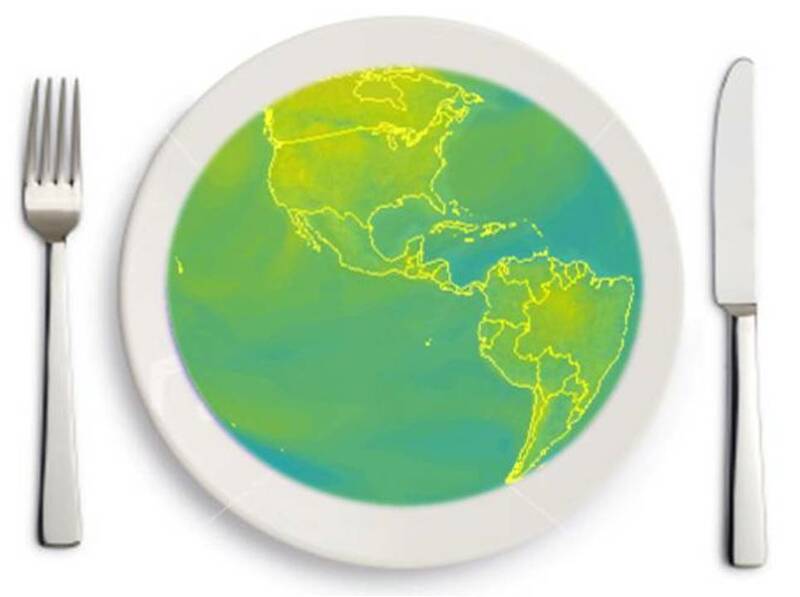 All aspects of food security are potentially affected by climate change, including food access, utilization, and price stability. Climate change will increase progressively the inter-annual variability of crop yields in many regions. 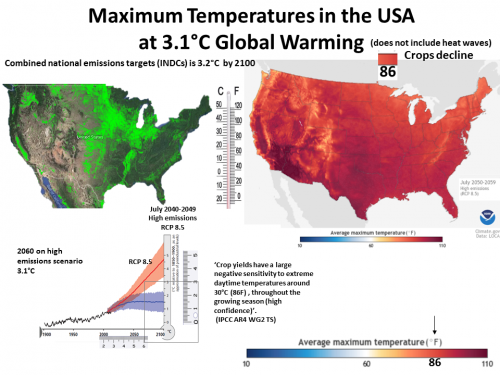 ​​Under scenarios of high levels of warming, leading to local mean temperature increases of 3-4C (global 2C - 2.7C) or higher, models based on current agricultural systems suggest large negative impacts on agricultural productivity and substantial risks to global food production and security. Such risks will be greatest for tropical countries, given the larger impacts in these regions, which are beyond projected adaptive capacity, and higher poverty rates compared to temperate regions. 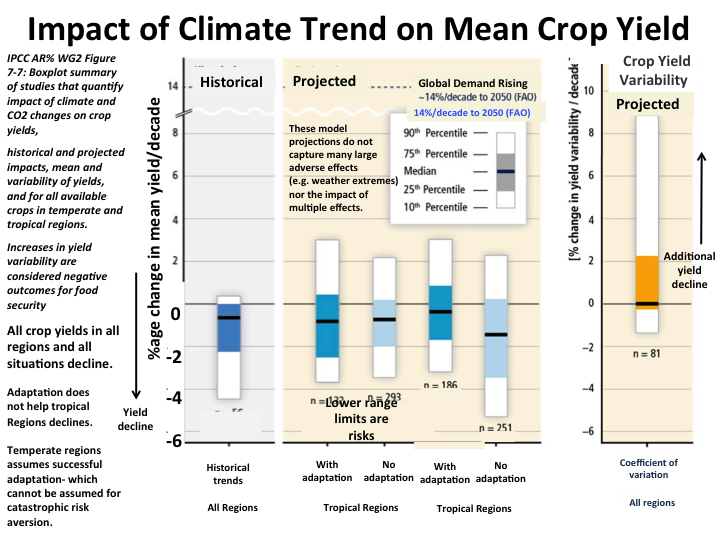 All weather extremes are being increased by global climate change and are most damaging to crops,but are not captured by the crop yield projection models. Hottest days have increased globally shows that and regionally most in: Western N. America, Western Europe,S. Mediterranean, N and West China, Mongolia, and S.E Australia. ​(AR5 WG1 Box 2.4, Figure 1). Anthropogenic forcing has contributed to the observed changes in the frequency and intensity of daily temperature extremes on the global scale since the mid-20th century. 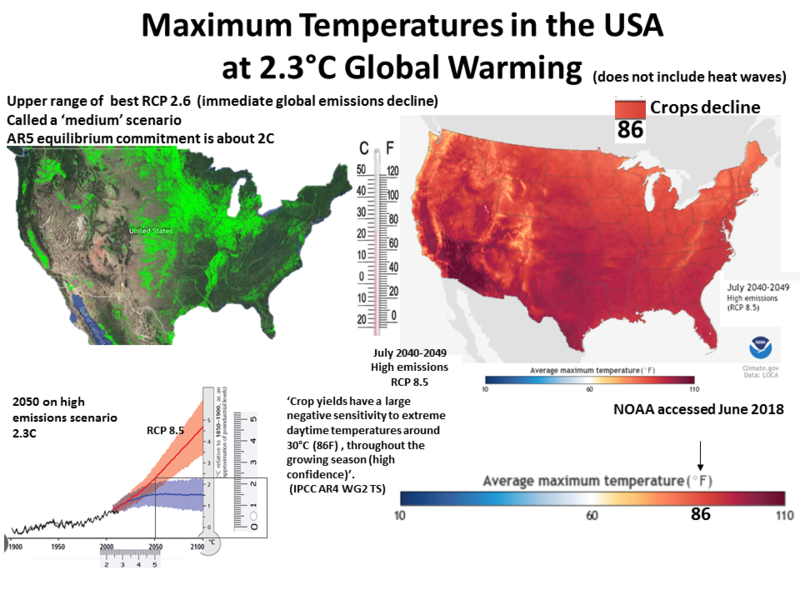 Attribution of changes in temperature extremes to anthropogenic influence is robustly seen in independent analyses using different methods and different data sets. 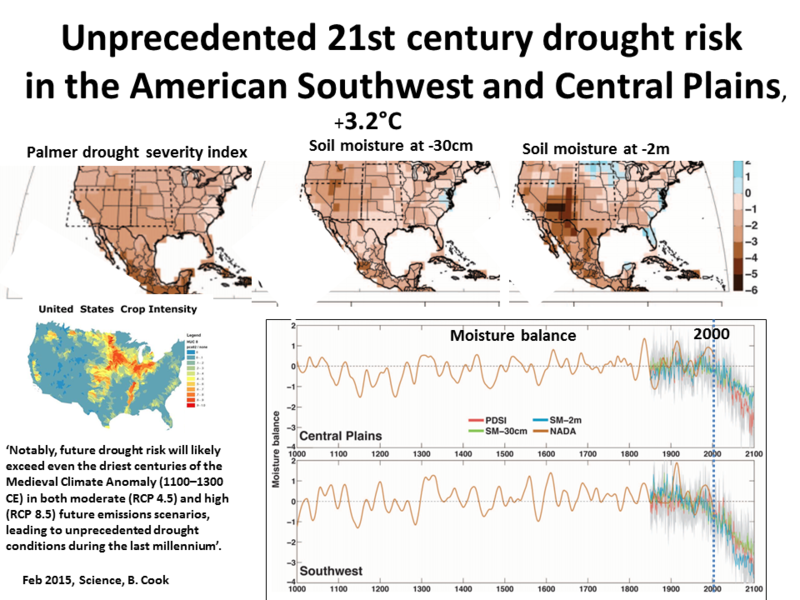 ​​Since the 1950s some regions of the world have experienced more intense and longer droughts​ (AR5 WG1 2.6.2.3). ​Stream flow decreasing trends in low and mid-latitudes are consistent with recent drying and warming in West Africa,southern Europe,south and east Asia, eastern Australia,western Canada and the USA, and northern South America. (AR5 WG2 3.2.2). Giorgi et al. (2011) indicate that ‘hydroclimatic intensity’, a measure which combines both dry spell length and precipitation intensity, has increased over the latter part of the 20th century in response to a warming climate. They show that positive trends (reflecting an increase in the length of drought and/or extreme precipitation events) are most marked in Europe, India, parts of South America and East Asia​ (AR5 WG1 2.6.2.3). 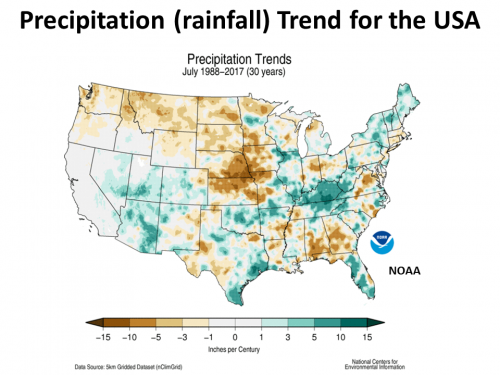 Future model projections project regional decreases in precipitation and in soil moisture​​. 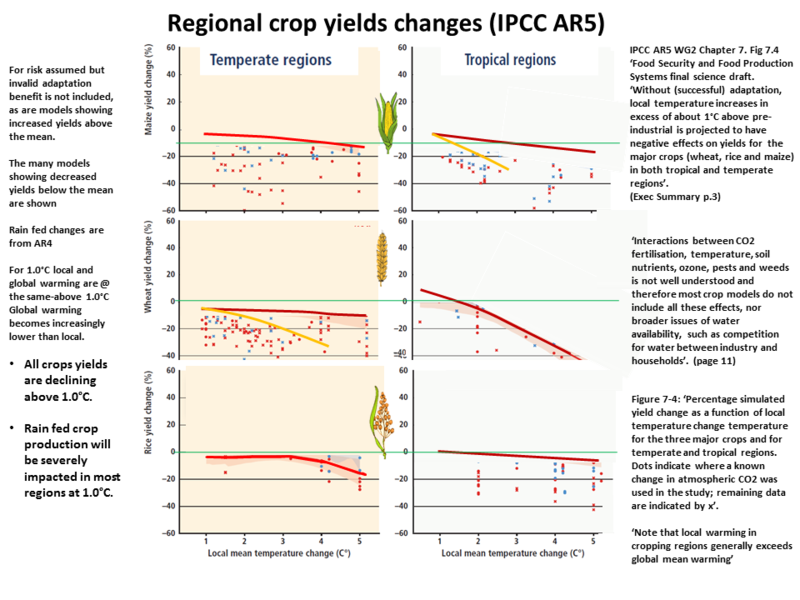 Negative impacts of climate change on crop and terrestrial food production have been more common than positive impacts, which are evident in some high-latitude regions (high confidence).